It's finally that time again for another wonderful SD Style Bloggers meet up! This will be a fun and interactive event at Bottles & Wood, a company that "repurposes glass, wood, and other locally sourced waste streams into products for the gift and hospitality industries." If you went to the THREADshow a few years ago and saw the BottleHood booth, this is the same company all grown up with a new partnership and a new showroom in the Clairemont Mesa area! 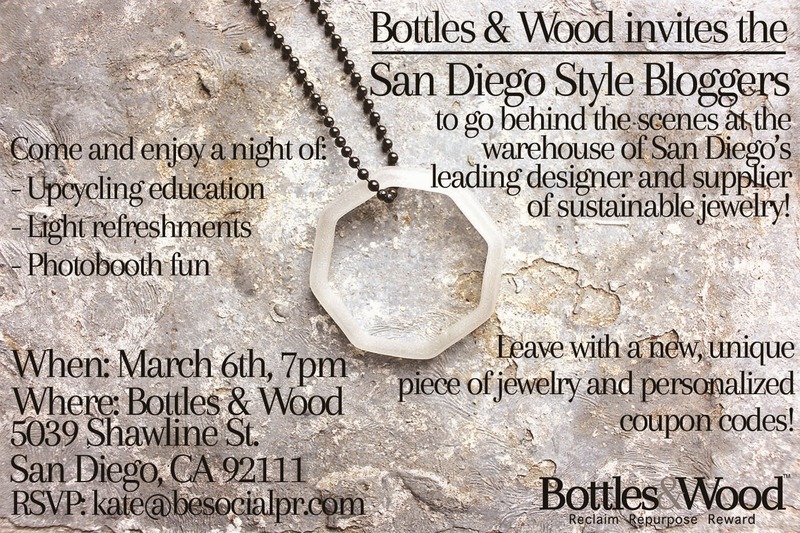 SD Style Bloggers will get a chance to get "behind the scenes" and make sustainable jewelry by bringing your own recyclable. A soda/liquor glass bottle of your choice to make into a beautiful take home piece! As always for SD Style Bloggers, this is a FREE meet up. Whether this is your first meet up or one of many, please join the SD Style Bloggers for this fantastic event and support sustainability at the same time!